Melanocytic nevi are common lesions that can be found on the integument of almost all individuals. Some patients present with few lesions, while others have hundreds. The number on a given individual increases in rough proportion to the degree of skin pigmentation. Melanocytic nevi can be broadly divided into congenital and acquired types. Determining if a lesion is congenital or acquired is generally easily accomplished by direct query of the patient, although, as noted above, some small congenital melanocytic nevi are tardive and may be perceived by the patient as acquired. When evaluating the nature of a melanocytic lesion, a number of attributes must be assessed. Further commentary describing physical attributes can be found in Physical. Whether a lesion has become symptomatic (eg, itchy, painful, irritated, or bleeding) is considered an important indicator of potential malignant change. Acquired melanocytic nevi are typically less than a centimeter in diameter and evenly colored. Melanocytic nevi most commonly are tan to brown, but coloration can be variable, ranging from skin-colored (nonpigmented) to jet black. The deep pigmentation associated with dark melanocytic nevi often stems from associated intracorneal pigmentation. The spectrum of "hypermelanotic" melanocytic nevus includes lesions with heavy epidermal pigmentation. Dysplastic melanocytic nevi have also been referred to as Clark nevi. The designation "dysplastic" was applied to such lesions because of an early belief that such lesions might be biologically unstable and represent common precursors of melanoma. Further study has not definitively confirmed that this is the case. 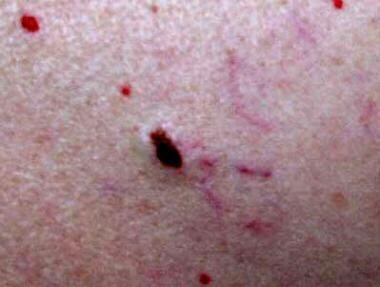 Dysplastic nevi present clinically as flattish, pigmented macules or thin papules. Often, a "fried egg" configuration is apparent, with a central papular area that is flanked by a macular zone of deeper pigmentation. Spitz nevi represent another distinctive variant of melanocytic nevus. In decades past, such lesions were referred to as "juvenile melanomas," but now they are recognized by specific microscopical features and are believed to be benign. Although Spitz nevi tend to manifest as pink papules on the head of a child, they can be clinically indistinguishable from conventional nevi in some instances; they also can be heavily pigmented. Heavily pigmented Spitz nevi may also be referred to as "Reed nevi" or "pigmented spindle cell nevi." Many Spitz nevi exhibit considerable associated vascular ectasia and, thus, display a hemangiomalike clinical appearance. Blue nevi represent melanocytic nevi with a dermal distribution of cellularity and spindled cytomorphology under the microscope. Such lesions are typically heavily pigmented. Because of the presence of deep pigmentation within a refracting colloidal medium (namely, the skin), the brownish-black pigment present contributes a bluish cast to such lesions, thereby explaining the name. The optical effect that accounts for clinical blueness is known as the Tyndall phenomenon. The Tyndall phenomenon is not unique or exclusive to blue nevi. Any melanocytic nevus with deep pigmentation may present clinically with a blue hue. Not all blue nevi are blue. Some present with various shades of gray, brown, or black. The clinical appearance varies depending on the degree of clinical pigmentation. Indeed, some blue nevi may be wholly amelanotic. Because of the fact that the term blue nevus is not always reflective of the true clinical appearance of the lesion, some dermatopathologists name blue nevi based on the cellular morphology present. The terms spindle cell melanocytic nevus or dendritic melanocytic nevus represent morphological terms that refer to the spectrum of blue nevi. Despite their variability in coloration, blue nevi are usually relatively small and reasonably symmetric, as typically is the case in benign lesions. Some blue nevi may be large and nodular with high cellularity under the microscope. Blue nevi typically occur on the distal extremities or scalp, but they can occur at any body site. Physical examination involves, at a minimum, careful visual inspection of the lesion in question; in some instances, an examination of the entire skin surface should be performed. Importantly, document the dimensions and coloration of any lesion evaluated and record its exact location. A simple drawing of the lesion and the overall topography can be helpful. Many dermatologists use topographic charts to record the location of multiple lesions that are monitored from visit to visit. Some dermatologists enumerate individual lesions to facilitate follow-up. For some patients, especially those with multiple melanocytic nevi, photographic documentation of lesions (including both distant views that demonstrate topography and close views that capture subtle features of a particular lesion) can be valuable. When examining melanocytic nevi, the physician should examine the scalp (possibly with the aid of a hair dryer), the palms, the soles, between the toes, and the genitalia. Congenital melanocytic nevi vary considerably in size and are commonly classified as small (< 1 cm), intermediate (1-3 cm), or large/giant (>3 cm). Congenital melanocytic nevi are generally relatively evenly pigmented and tan or brown, especially those that are thin. In some congenital nevi, the cells extend from the level of the epidermis to the subcutaneous fat. These lesions can have an array of colors, and, at times, they cannot be easily distinguished from melanoma based solely on findings from the clinical evaluation. Congenital melanocytic nevi are hamartomalike; that is, they contain a predominance of melanocytes but also seem to have simultaneous accentuation of other cutaneous elements. Thus, an increase in the number of hair follicles, the presence of follicles of increased size, or an increase in other appendages may be observed. Conventional or common acquired melanocytic nevi are generally less than 1 cm in diameter and evenly pigmented. Some atypical melanocytic nevi (melanocytic nevus of the so-called Clark or dysplastic type) exceed 1 cm in size, especially when such lesions occur on the trunk. Junctional melanocytic nevi are macular or thinly papular. Junctional lesions typically range from brown to brownish-black. The darker coloration of junctional melanocytic nevi stems from the fact that the surface epidermis is often simultaneously hyperpigmented. Compound and intradermal melanocytic nevi display elevation relative to surrounding uninvolved skin. Compound melanocytic nevi are often lighter in color than junctional nevi and range from tan to light brown. Some compound melanocytic nevi have areas of dark pigmentation, particularly those that have been recently irritated or traumatized. Many wholly intradermal melanocytic nevi display no significant pigmentation. The development of a new area of pigmentation within a long-standing nonpigmented or lightly pigmented compound or intradermal melanocytic nevus, as shown in the image below, is a cause for concern. While pigmentary changes could be due to incidental inflammation or recent irritation or trauma, the possibility of evolving melanoma is also a consideration in the differential diagnosis. Generally, a biopsy for microscopic examination is warranted in this context. A conventional (papular) melanocytic nevus occurring within acral skin. Note slight border irregularity, a feature common in association with acral nevi. Dysplastic or atypical nevi (also known as Clark nevi) are acquired variants that are relatively flat, thinly papular, and relatively broad. Often, such lesions exhibit target-like or fried egg–like morphology, as noted above, with a central papular zone and a macular surrounding area with differing pigmentation. Dysplastic nevi often occur in a familial fashion. Affected individuals may present with dozens or hundreds of such lesions. Almost invariably, individuals with dysplastic nevi are of northern European ancestry from the United Kingdom, the Netherlands, Germany, or, occasionally, Poland or Russia. Most of these individuals have fair skin and other Celtic features. Some individuals have only a few atypical nevi, and their risk of melanoma may not be much higher than persons without such nevi. Persons with large numbers of nevi (>100) have a high lifetime risk of melanoma that approaches unity. Persons with large numbers of nevi and a familial history of melanoma (consisting of ≥ 2 members of the primary family with melanoma) have an extremely high risk of developing melanoma and deserve vigilant clinical monitoring. Dysplastic nevi generally grow through lateral extension of the intraepidermal component of the lesion; therefore, these lesions often assume the clinical configuration of a fried egg, with a central papular zone and a surrounding macular area of differing pigmentation. The peripheral border is often perceived as blurred or fuzzy because of this lateral extension of superficial melanocytes. 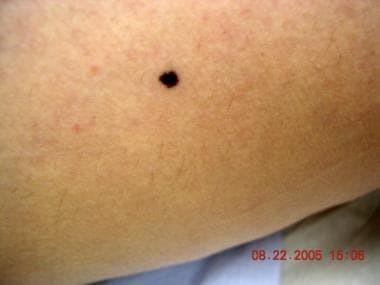 Some authorities have postulated that Clark (dysplastic) nevi (shown below) are significant or common precursors to melanoma. The designation dysplastic was chosen to suggest that these lesions represent an intermediate (unstable) form between conventional nevi and melanoma. This concept remains controversial. They may represent precursor lesions, markers for an increased risk of de novo melanoma, or both. Some data suggest that most melanomas in patients with the dysplastic nevus syndrome occur de novo. While the removal of all dysplastic nevi from an individual with melanoma is generally not indicated, removal of lesions with a highly atypical appearance is indicated to be certain that melanoma is not present. A Clark (dysplastic) nevus with modest variation in pigmentation and irregular borders. Biopsy of the lesion proved no evidence of melanoma. A compound Clark (dysplastic) nevus with fried egg–like clinical morphology, with a central dark papule flanked by an eccentric more lightly pigmented macular zone. Spitz nevi (shown below) vary considerably in size, but they generally are smaller than 1 cm in diameter. Many Spitz nevi have a keratosislike quality because of associated epidermal hyperplasia and hyperkeratosis, and some have an angiomalike appearance because of associated vascular ectasia. The degree of pigmentation of Spitz nevi also varies; a heavily pigmented, small, spindle cell variant on the legs of women has been referred to as "pigmented spindle cell nevus" or "Reed nevus" because the pigmented spindle cell variant was described by Richard Reed. A heavily pigmented junctional Spitz nevus, also known as pigmented spindle cell nevus. Note that many Spitz nevi are nonpigmented and may have an angiomalike clinical appearance. Blue nevi are not always blue, and they are not even always pigmented. The designation blue nevus, although flawed, has been preserved for historical reasons. Blue nevi are sometimes larger than other melanocytic nevi, occasionally measuring 2 cm or greater in diameter. This is particularly true of cellular lesions (cellular blue nevi) that occur at sun-protected sites, such as the buttocks. Blue nevi are often firm because of associated stromal sclerosis, and they often have a nodular quality, a reflection of their deeper position within the skin. Heavily pigmented blue nevi manifest clinically as blue, black, or gray lesions, whereas blue nevi with lesser degrees of pigmentation may be tan or brown or strictly the color of surrounding healthy skin. Hypocellular blue nevi that cover an extensive clinical distribution have been referred to as "dermal melanocytic hamartomas" by some authors. This spectrum includes the entities nevus of Ito, nevus of Ota, and nevus of Sun. The etiology of melanocytic nevi remains unknown. No established genetic or environmental influences are known to contribute to the development of congenital nevi. However, after studying 144 children in Naples, researchers concluded that development of melanocytic nevi early in life is the result of complicated relationships among nevus evolution, anatomic location, and environmental and constitutional factors. The specific genetic factors that contribute to the development of acquired melanocytic nevi also remain unknown. However, data suggest that the propensity for developing large numbers of nevi, such as multiple dysplastic nevi, might be inherited as an autosomal dominant trait. 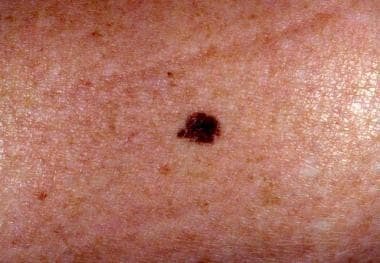 Patients with the familial atypical multiple mole and melanoma syndrome (also known as the dysplastic nevus syndrome) develop dozens to hundreds of melanocytic nevi and have an elevated lifetime risk for the development of melanoma. As the name implies, this disorder is believed to have an inherited basis. As noted previously, population-based evidence suggests that ultraviolet irradiation may trigger the development of acquired melanocytic nevi. The number of melanocytic nevi in childhood is inversely related to the degree of skin pigmentation and is high in children with poor sun tolerance. The mechanism of this induction has not been adequately investigated, but such induction could represent an example of tumor promotion by ultraviolet light. No known complications are directly related to the presence of melanocytic nevi; however, minor surgical intervention during the biopsy or the removal of such lesions can lead to common complications (eg, infection, hemorrhage). Natarajan K, Arunachalam P, Sundar D, Srinivas CR. Congenital melanocytic nevi: catch them early!. J Cutan Aesthet Surg. 2013 Jan. 6(1):38-40. [Medline]. Palicka GA, Rhodes AR. Acral melanocytic nevi: prevalence and distribution of gross morphologic features in white and black adults. Arch Dermatol. 2010 Oct. 146(10):1085-94. [Medline]. Kelly JW, Rivers JK, MacLennan R, Harrison S, Lewis AE, Tate BJ. Sunlight: a major factor associated with the development of melanocytic nevi in Australian schoolchildren. J Am Acad Dermatol. 1994 Jan. 30(1):40-8. [Medline]. Harrison SL, MacLennan R, Buettner PG. Sun exposure and the incidence of melanocytic nevi in young Australian children. Cancer Epidemiol Biomarkers Prev. 2008 Sep. 17(9):2318-24. [Medline]. Zalaudek I, Schmid K, Marghoob AA, et al. Frequency of dermoscopic nevus subtypes by age and body site: a cross-sectional study. Arch Dermatol. 2011 Jun. 147(6):663-70. [Medline]. Haenssle HA, Mograby N, Ngassa A, Buhl T, Emmert S, Schön MP, et al. Association of Patient Risk Factors and Frequency of Nevus-Associated Cutaneous Melanomas. JAMA Dermatol. 2015 Nov 4. 1-8. [Medline]. Gellén E, Janka E, Tamás I, B Á, I H, Emri G, et al. Pigmented naevi and sun protection behaviour among primary and secondary school students in an Eastern Hungarian city. Photodermatol Photoimmunol Photomed. 2015 Oct 19. [Medline]. Menzies SW, Stevenson ML, Altamura D, Byth K. Variables predicting change in benign melanocytic nevi undergoing short-term dermoscopic imaging. Arch Dermatol. 2011 Jun. 147(6):655-9. [Medline]. Patruno C, Scalvenzi M, Megna M, Russo I, Gaudiello F, Balato N. Melanocytic Nevi in Children of Southern Italy: Dermoscopic, Constitutional, and Environmental Factors. Pediatr Dermatol. 2013 May 31. [Medline]. Khera S, Sarkar R, Jain RK, Saxena AK. Neurocutaneous melanosis: an atypical presentation. J Dermatol. 2005 Jul. 32(7):602-5. [Medline]. Tran KT, Wright NA, Cockerell CJ. Biopsy of the pigmented lesion--when and how. J Am Acad Dermatol. 2008 Nov. 59(5):852-71. [Medline]. Longo C, Piana S, Lallas A, Moscarella E, Lombardi M, Raucci M, et al. Routine Clinical-Pathologic Correlation of Pigmented Skin Tumors Can Influence Patient Management. PLoS One. 2015. 10 (9):e0136031. [Medline]. Valdebran M, Elbendary A, Chaitanya Arudra SK, Torres KM, Elattar I, Elston DM. Nuclear and cytoplasmic features in the diagnosis of banal nevi, Spitz nevi, and melanoma. J Am Acad Dermatol. 2016 Aug 16. [Medline]. Harms PW, Hocker TL, Zhao L, Chan MP, Andea AA, Wang M, et al. Loss of p16 Expression and Copy Number Changes of CDKN2A in a Spectrum of Spitzoid Melanocytic Lesions. Hum Pathol. 2016 Aug 25. [Medline]. Ko CJ, McNiff JM, Glusac EJ. Melanocytic nevi with features of Spitz nevi and Clark's/dysplastic nevi ("Spark's" nevi). J Cutan Pathol. 2009 Oct. 36(10):1063-8. [Medline]. Ackerman AB, Milde P. Naming acquired melanocytic nevi. Common and dysplastic, normal and atypical, or Unna, Miescher, Spitz, and Clark?. Am J Dermatopathol. 1992 Oct. 14(5):447-53. [Medline]. Ackerman AB, Magana-Garcia M. Naming acquired melanocytic nevi. Unna's, Miescher's, Spitz's Clark's. Am J Dermatopathol. 1990 Apr. 12(2):193-209. [Medline]. Harth Y, Friedman-Birnbaum R, Linn S. Influence of cumulative sun exposure on the prevalence of common acquired nevi. J Am Acad Dermatol. 1992 Jul. 27(1):21-4. [Medline]. Richtig E, Jung E, Asback K, Trapp M, Hofmann-Wellenhof R. Knowledge and perception of melanocytic nevi and sunburn in young children. Pediatr Dermatol. 2009 Sep-Oct. 26(5):519-23. [Medline]. Carrera C, Puig-Butillè JA, Aguilera P, Ogbah Z, Palou J, Lecha M, et al. Impact of Sunscreens on Preventing UVR-Induced Effects in Nevi: In Vivo Study Comparing Protection Using a Physical Barrier vs Sunscreen. JAMA Dermatol. 2013 May 8. 1-11. [Medline]. Moreno S, Soria X, Martínez M, Martí RM, Casanova JM. Epidemiology of Melanocytic Naevi in Children from Lleida, Catalonia, Spain: Protective Role of Sunscreen in the Development of Acquired Moles. Acta Derm Venereol. 2015 Nov 9. [Medline]. A melanocytic nevus occurring within conjunctival epithelium. A conventional compound melanocytic nevus. Note the presence of melanocytes with small nuclei in nests along the dermoepidermal junction and the presence of similar melanocytes in nests and syncytia in the subjacent dermis. This Spitz nevus shows large melanocytes with spindled and epithelioid cytomorphology arrayed along the junctional zone of an acanthotic and hyperkeratotic epithelium. At higher magnification, this Spitz nevus also demonstrates large, dull-pink globules along the junctional zone. These structures are known as Kamino bodies. Kamino bodies are most commonly observed in association with Spitz nevi but are occasionally observed in melanocytic nevi of other types. Well-formed Kamino bodies are almost never (if ever) found in association with melanoma. This blue nevus is composed of small dendritic melanocytes. This type of cytomorphology can be seen in so-called common blue nevi and in topographically restricted lesions such as nevus of Ito or nevus of Ota. This large congenital nevus developed papular areas of pigmentation within it. Microscopic examination proved that the "new" areas represented small nodular collections of benign melanocytes, with no evidence of evolving melanoma. Histopathologically, a congenital nevus differs from an acquired melanocytic nevus in that melanocytes are often distributed deeply within the reticular dermis, within the adventitial dermis around adnexal elements, and sometimes within the subcutis. This congenital nevus shows a folliculocentric array of melanocytes.